Travel Tips for Saint Martin, Updated Intl. Guide – Travel Medicine, Inc.
Time Zone: -4 hours. No daylight savings time in 2008. Electrical Standards: Electrical current is 120/60 (volts/hz). Grounding Adaptor Plug A. • Passport/Visa: Visa not required. 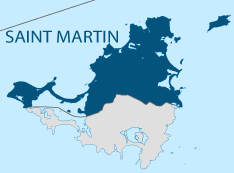 Saint Martin is a French Dependent Territory. • HIV Test: Not required. Hopital de Marigot (55 beds); general medical/surgical facility; physicians on call 24 hours. Dengue Fever: This mosquito-transmitted viral disease is prevalent in the Caribbean. Approximately 900 suspected cases of dengue fever, a significant increase over the average incidence, have been reported from the Caribbean islands of St. Martin (700 cases) and St. Barthelemy (200 cases) since December 2009.Travelers should take measures to prevent daytime insect bites. For maximum protection, apply a DEET-containing repellent to exposed skin (30% concentration recommended), apply permethrin spray or solution to your clothing and gear, and sleep under a permethrin-treated bednet. • DEET-based repellents have long been the gold standard to prevent mosquito and tick bites. The CDC and the World Health Organization now recommend 20% picaridin repellents as an effective DEET alternative. Hepatitis: Low risk to tourists. All nonimmune travelers should receive hepatitis A vaccine. Other Diseases/Hazards: Ciguatera fish toxin poisoning (outbreaks have occurred), and swimming related hazards (jellyfish, spiny sea urchins, and coral). There are no sea snakes in the Caribbean. Ciguatera poisoning: Most reported cases of ciguatera poisoning have involved travelers who ate fish in the Caribbean while on holiday. These cases included consuming grouper in the Dominican Republic, kingfish in Jamaica, barracuda in Haiti and a fish casserole in Cuba. • Any reef fish can cause ciguatera poisoning, but species such as barracuda, moray eel, grouper, red snapper, jack, sturgeon and sea bass are the most commonly involved. The occurrence of toxic fish is sporadic, and not all fish of a given species or from a given locality will be toxic. The ciguatoxin is not destroyed by cooking. Rabies: St. Martin is considered rabies-free but stray and sometimes viscous dogs may be encountered. All unprovoked animal bites should be medically evaluated for possible post-exposure treatment. Travelers' Diarrhea: Low to moderate risk. In urban and resort areas, the hotels and restaurants generally serve reliable food and potable water. Outside of hotels and resorts, we recommend that you filter or purify all drinking water or drink only bottled water or other bottled beverages and do not use ice cubes. Avoid unpasteurized milk and dairy products. Do not eat raw or undercooked meat or fish. Peel all fruits.